The mazur and mazurek (i.e. small mazur), or in English mazurka, are general terms for a series of Polish folk dances in triple meter, which originated in the plains of Mazovia around Warsaw. The people of the province were called Mazurs; thus, the dance mazur bears the same name as the male inhabitant of the region. 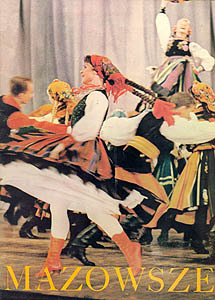 The dances, known abroad as mazurkas, comprise more than one type: mazur or mazurek, the obertas or oberek, and the kujawiak from the neighboring district of Kujawy. These dances are linked by common rhythmic and choreographic traits, especially the mazurka rhythm discussed below. The name is much younger than the dance itself, and probably originated outside of the region. This term appears for the first time in J. Riepel's music dictionary published in Germany in 1752. The dance was known as early as the 16th century; early lute and organ tablatures feature many instances of the mazurka rhythm in pieces entitled Polish dance, or in Latin, Chorea polonica. During the 17th century the dance spread over Poland and began to appear also in neighboring countries; distinct versions of these dances could be found in the repertoire of the countryside (the folk mazur-type dances and the mazur of the nobility), and the towns (urban mazurka). Augustus II, the Elector of Saxony and King of Poland (1697-1733) was very fond of this dance and introduced it into the courts of Germany. Following Poland's loss of independence, the dance became fashionable in higher social circles in Paris, then London, and other centers of Western Europe. In 1830, the British paper The Observer (25 April 1830) described the mazurka as "just introduced, or intended to be introduced, into this country." In the 1830s and 1840s, the mazurka enjoyed its greatest popularity in the Western salons; along with the krakowiak and the polonaise, it served as a sign of solidarity with the oppressed Polish nation, the cause championed by Polish exiles in Paris and their aristocratic patrons. Paradoxically, after the partitions of Poland, the mazurka also became popular among the Russian aristocracy and peasantry. An important fact in the history of the mazurka is its appearance in the Polish national anthem. Mazurek Dąbrowskiego (Dąbrowski Mazurka) was created in 1797 as a Song of the Polish Legion for the troops of General Jan Dąbrowski, serving Napoleon during his conquest of Europe with the hope of regaining Poland's independence. The melody of the anthem is of anonymous, folk origin; the text was penned by Józef Wybicki (for more information visit the PMC National Anthems Site). Thus, the fast-paced, energetic dance became a national symbol in several distinct ways. The most characteristic feature of the dance is the presence of the so-called mazurka rhythms, which occur in a variety of non-dancing songs and dances from the central and western parts of Poland. According to current research, it is not possible to describe traits which would unequivocally distinguish an oberek from a mazur or a kujawiak (the rhythm is further discussed in the section on "music"). There are many folk dances that fall into this category, besides the ones mentioned above: ksebka, obertas, okrągły (round), okrąglak (round), and owczarek (shepherd). Oskar Kolberg stated in the first volume of his monumental folklore collection, Pieśni ludu polskiego (Songs of the Polish people 1857), that kujawiak, i.e. obertas, is the most popular dance in the whole country. In his later writings, Kolberg distinguishes between these dances differing in tempo, with the mazur occupying the middle ground between the slow, lyrical kujawiak and the furiously fast-paced oberek. Moreover, he describes a performance practice of dancing a set of three dances, a chodzony (walking dance, folk version of the polonaise), followed by a kujawiak, and a mazur or an obertas (oberek). Left: State Group, Mazowsze, 1964. This confusion of terminology and typology arose because of the great popularity of these dances and the existence of many regional variants. According to the New Grove Dictionary of Music and Musicians, the mazurkas "that remained unaltered by influences of urban music seem to have no definite ending, as the repeats are made ad libitum, or their concluding bar finishes on the dominant on the third beat, without accent leaving the impression of disappearance into the air [...] A certain pride of bearing and sometimes a wildness sharply differentiate its mood from that of the more sensuous waltz. The dance has the character of an improvisation, and is usually danced by four, eight or 12 couples, but sometimes by an indefinite number of dancers." The folk dance is improvisatory in character; it is danced by couples who rotate around the dance hall and present a variety of gestures. As an "exhibition" dance it is regarded as the "most exciting and intricate of the five national dances of Poland" (Ada Dziewanowska: Polish Folk Dances and Songs, p. 509). Dziewanowska described the mazur as filled with contrasts: "it combines the fiery spirit with pride and elegance, vivacity with lyricism, dignity with joy, and boldness with gallantry." Left: Krakusy in Mazur, 1999. The position of the body resembles that of the polonaise - head held high, torso erect, graceful motion of the hands. The difference of the character stems primarily from the faster tempo and the presence of irregularly spaced accents, stomps and clicks of the boots. 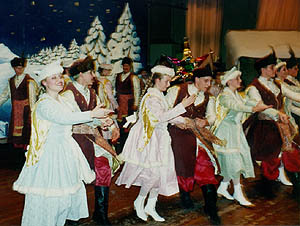 There are four versions of the mazur that could be presented by a folk dance group: the dance of the nobility (in 17th-century costumes), the salon dance of the Napoleonic era (in the appropriate military [men] and salon [women] mixture of clothing), the dance of urban folk or a peasants' dance from central Poland. Each type of dance would emphasize different class characteristics of portrayed strata of Polish society. There are a number of basic steps: bieg mazurowy (running step), sideways step, sliding step, and the hołubiec (clicking heels together, similar to the step in the krakowiak). There are also many hand positions, figures, and turns that could be used by couples performing this dance. A different set of group figures is available for ensembles. Thus, the dance leaves much room for the creativity of its choreographer and the spontaneity of individual dancers. Left: Krakusy, the hołubiec step, 1999. Since there are at least four different socio-historical versions of the mazur (17th-century nobility, 19th-century patriotic society, peasants from central Poland, regional varieties from western and south-central Poland, etc. ), there are a variety of costumes available for performance. If the version of the nobility is chosen (at times to music from the classical tradition, e.g. the Mazur from Stanisław Moniuszko's The Haunted Manor), the clothing should be that of the 17th-century Polish nobility wearing fur-lined jackets (kontusz) and hats. (For more information about this type of costume, see the entry on polonaise). The Polskie Iskry wear a stylization of this costume with women wearing shorter skirts and different shoes that would have been used by the Polish gentry. 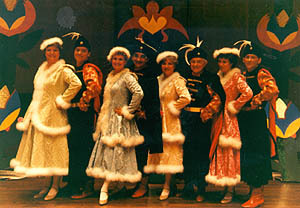 The "high-society" mazur may also be performed by the 19th-century Polish legionists (in Napoleonic uniforms, and special square hats bearing the national emblem, an eagle on the front) and their charming partners in Empire gowns, long gloves and at times light, flowing scarves covering their almost-bare shoulders (see polonaise for a more detailed description of this costume). The folk versions of the mazur, especially from central Poland, could feature the costumes of different regional varieties, for instance the boldly colored, striped skirts and capes of women from the Łowicz area in central Mazowsze, or any other type of the Mazovian costume (of which there are several). The regional costumes used by Polish folk dance ensembles differ considerably from historically documented clothes worn by peasants from the region in the 19th century, for instance the couple from Raszyn, near Warsaw, as represented in Oskar Kolberg's Pieśni ludu polskiego (1857). Left: Costume from Mazovia, Kolberg, 1857. Nonetheless, the dance groups prefer to present the mazur as the dance of the nobility, reserving the folk costumes for performances of the faster and slower variants, i.e. the oberek and kujawiak. It is also possible to find mazur-type dances in Wielkopolska, Małopolska, or Lubelskie - indeed, with the richness of costumes and the variety of variants available, the mazur truly is a national dance and may appear in suites of dances from all these regions. Mazurs, obereks, and other dances from this group are in triple meter and contain the mazurka rhythms consisting of a pattern of two sixteenths followed by two eighth-notes (in a three-eighths meter), i.e. two short and two long notes. In Polish folk music the basic pattern is derived from 8-, 7- or 6- syllable verses of the mazur folk song; the strophes are structured regularly and consist of four verses set in eight measures of the music. (The pattern of eight measures in three-eighths meter is reproduced on the left, with the beginning of the next system marked at the left, in the third line). In the music, strong accents are irregularly placed on the second or third beat of the measure. There is also a marked tendency to end the phrase on the dominant pitch located on an unaccented third beat in the measure. The tempi vary greatly between the various types of the dance, and also geographically (the dances are faster in southern Poland than in the northern part of the country). The oberek or obertas is usually the fastest, with MM=160-180; while the regular mazur is performed in the tempo range of MM = 120-40 (the kujawiak is still slower). The music consists of two or four parts, each part having six or eight bars, and each part is repeated. According to Helena Windakiewiczowa, the mazurka also has a melodic structure based on such schemes as AABB, AABC, AAAB or ABBB. The accompaniment to the earliest mazurkas was played on the dudy, i.e. a folk bagpipe, which produced either one drone (the tonic) or two (the tonic and dominant). Left: Mazur from Kolberg, 1857. A singer would then improvise the melody, and sometimes even the text of the couplets, to this stable accompaniment. 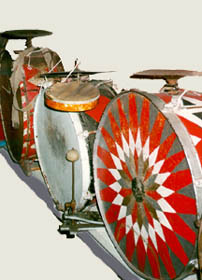 The most common ensemble performing in the Mazowsze region consists of a violin, a large drum (as depicted below, from the Ethnographic Museum in Warsaw), and later, a Polish folk accordion (with three registers, harmonia trzyrzędowa), and clarinet. Folk fiddlers often play many variants of the same melody, with different, elaborate ornamentation in each of the variants. There are differences from one part of the region to another, including the areas centered around cities of Płock, Łowicz, Skierniewice, Rawa, and the southern Mazowsze. In terms of pitch organization, many Polish folksongs, including the mazurka, are modal, in the Lydian mode with a sharpened 4th; the first six notes of this mode were sometimes known as the "Polish mode." The introduction of the mazurka to art music is usually credited to Fryderyk Chopin, though his predecessors included Maria Szymanowska, and others. While Chopin's borrowings from folk, urban, or salon types of the mazurka have been extensively discussed by scholars (e.g. Mieczysław Tomaszewski, Elżbieta Witkowska, Barbara Milewski), certain melodic, harmonic, rhythmic and formal traits point to their close relationship with the idiosyncratic features of the folk mazur-type dances. Several stylized mazurs of the nobility appear in the stage music of Stanisław Moniuszko (operas Halka and Straszny Dwór [The Haunted Manor]). Other Polish composers interested in the mazurka include Aleksander Tansman, Karol Szymanowski, and Roman Maciejewski. In America, the mazurka (the title was usually in this spelling) appeared in 1840s; salon composers wrote the mazurkas as dances associated with Poland and its celebrated loss of independence, or as fashionable dances dedicated to society ladies. 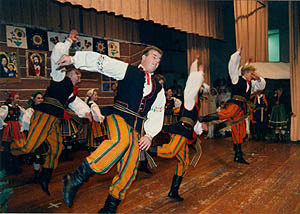 In some variants the mazurka is crossed with the polka - a salon dance, not its folk counterpart. Aleksander Janta lists about 30 mazurkas in his study of nineteenth-century American-Polish music (1982, 128); one publication describes the mazurka as a Russified dance: "The Mazourka is the national dance of Poland, and was introduced into Russia when the Russians subjected Poland. The Russians dance, or rather walk, the Mazourka with a dignified air, but they lack the natural animation and graceful ease adapted by the Poles" (from an 1845 New York edition of A Set of Mazurkas and a Set of Polkas by Coote and Glover). Burhardt, Stefan. Polonez. Katalog Tematyczny (Polonaise: Thematic catalogue), 3 vols. Kraków: PWM Edition, 1976. Dąbrowska, Grażyna. Taniec ludowy na Mazowszu [Folk dance in Mazovia]. Kraków: PWM Edition, 1980. Harley, Maria Anna. "Dance as a National Symbol: Polish Dance in Southern California." Project for Southern California Studies Center at USC, August 2000. Janta, Aleksander. A History of Nineteenth Century American-Polish Music. New York: The Kościuszko Foundation, 1982. Kolberg, Oskar: Pieśni ludu polskiego [Songs of the Polish people], vol. 1 of Dzieła Wszystkie [Complete Works]. Wrocław-Poznań: Polskie Towarzystwo Ludoznawcze, 1962. Reprint of a 1857 publication. "Mazur, mazurek," entry in Encyklopedia Muzyki PWN. Warszawa: PWN, 1994. "Mazurka," entry in the New Grove Dictionary of Music and Musicians, vol. 11. Stanley Sadie, ed. London: McMillan, 1980. Windakiewiczowa, Halina. Wzory polskiej muzyki ludowej w mazurkach Fryderyka Chopina. [Patterns of Polish folk music in F. Chopin's mazurkas]. Warsaw, 1926. Illustrations from Polish folk art (straw cutouts); Zofia Stryjeńska's 1927 "Mazur" image; photographs from the PMC Collection and from archival material gathered for M.A. Harley's Polish Dance in Southern California project.